On September 9th 2016 a slow fireball with cometary orbit could be detected with SMART Project's cameras located in different Observatories in central and south Spain. One of those observatory is Calar Alto Observatory, where this fireball could also be recorded. 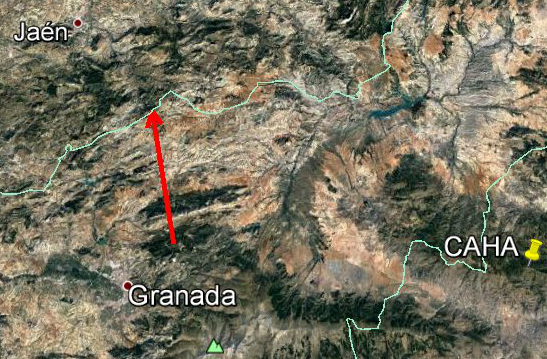 The fireball flew over Granada province (south Spain) and followed a trajectory from south to north. This object could be seen at 21:38:55 UT (23:38:55 local time) and was reported by eye witnesses. Following the analysis of Professor José María Madiedo (University of Huelva), PI of SMART Project, the fireball was caused by the impact of an object with our atmosphere at a speed of about 73.000 km/h. The luminous phenomena started at an altitude of about 79 km over Granada province (South Spain), and finished at about 34 km above the ground. This object was a slow fireball following a cometary orbit. But may be the most significant thing of the images taken by the Calar Alto Observatory SMART Project camera is the good definition of its spectral emission, that can be seen at both sides of the fireball (see the left image). This spectrum is obtained thanks to the diffraction grating installed at all the SMART Project cameras. 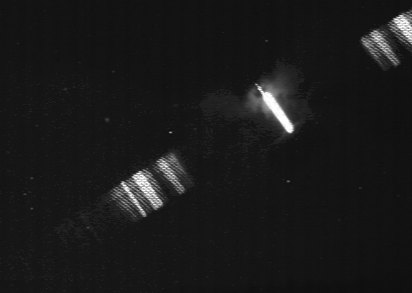 This grating decompose the light from the fireball, and its analysis allows to know the chemical composition of the meteoroid that generates the phenomenon. This also gives important data concerning the chemical composition of this meteoroid's parent object.